Last week, Trump announced that the US would exit the Paris Agreement. Since then, everyone from global leaders to US mayors and governors have reaffirmed their commitment to this historic climate deal, some even stepping up to go beyond. On June 10th, we’re going to mobilize in at City Halls and State Houses across the country to defend the Paris Agreement and show that we are still ready to #ActOnClimate and move our country towards 100% renewable energy! We will celebrate those cities, states, and other institutions who have committed to meet the goals of the Paris Agreement -- and urge those who haven't committed to take action now. 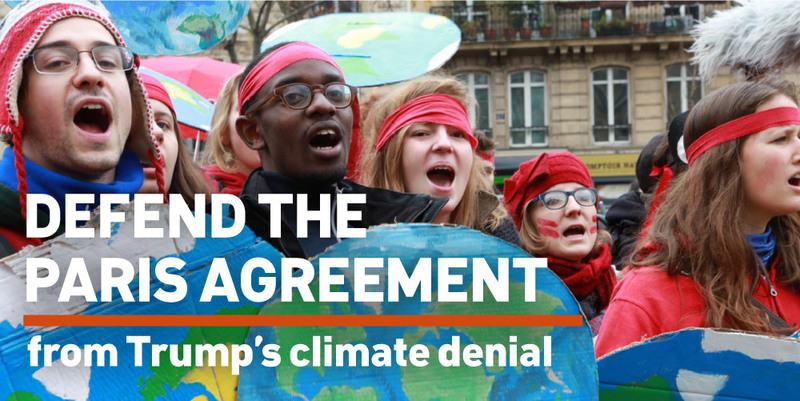 Together, we will rally for the steps we know are necessary to deliver on the goals of Paris: moving to 100% renewable energy, stopping new fossil fuel projects, divesting from coal, oil and gas companies, and more. Find and join an action near you on Saturday, June 10th by typing in your zip code and clicking "Find Nearby Events" on the top right of the page. If there's not an event near you, click "Host an event" to organize your own. For help with hosting an event, check out our Host Toolkit.